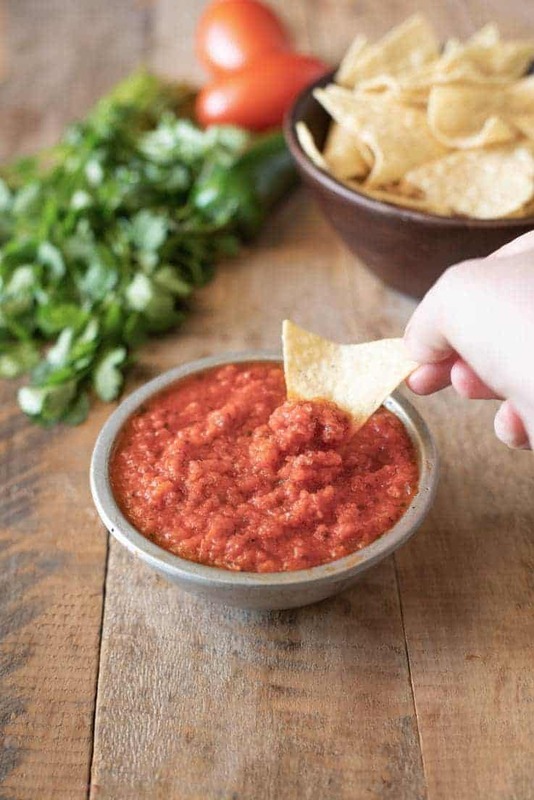 Easy Restaurant-Style Red Salsa Recipe is everything you want in a fast, easy and delicious salsa with a little twist. For extra flavor, tomatoes, onions and jalapeño are broiled until slightly charred then everything is blended with cilantro and salt. 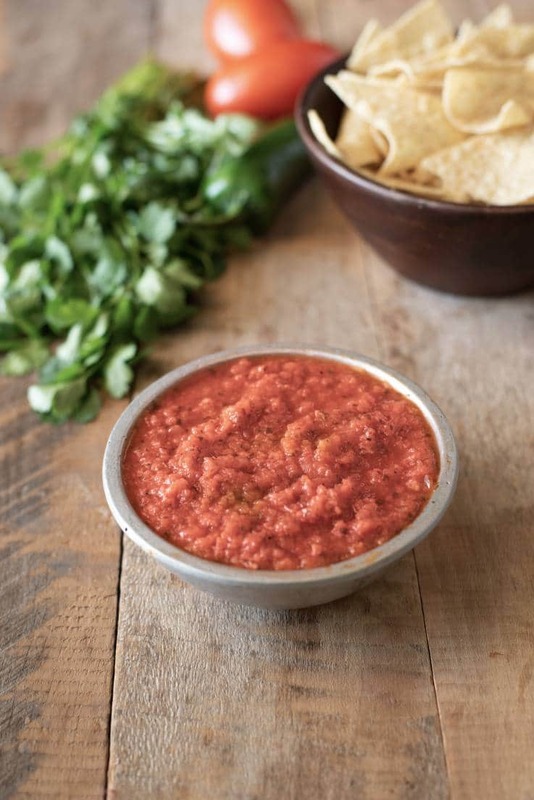 We all should have a good red salsa in our repertoire and this salsa recipe could not be easier. You can just through everything into the blender, but why not take the time to broil the vegetables to add a little extra flavor.? The charring and slight cooking of the veggies really brings out their natural sweetness. I can’t think of a reason not to, since it only takes 15 minutes. 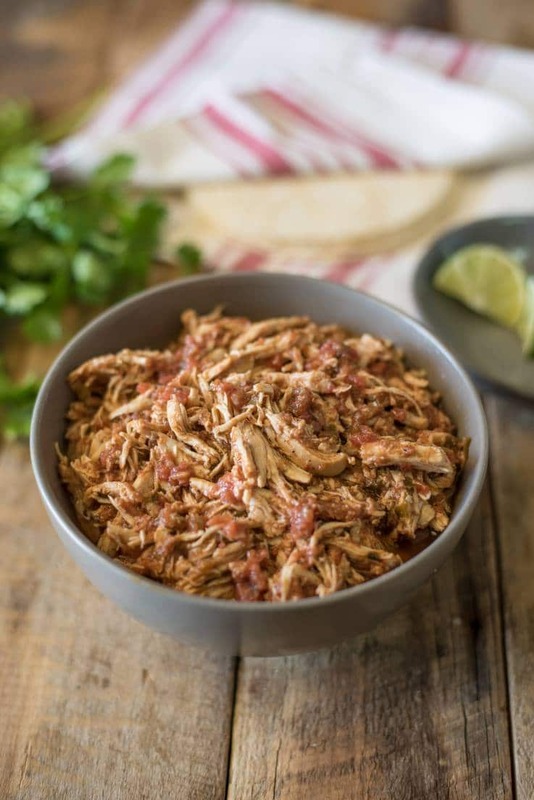 Salsa is always good as a snack with tortilla chips, but I like to use this salsa in my recipe for Crockpot Mexican Shredded Chicken (recipe link below). It is an amazing and quick way to take plain chicken breasts and turn them into flavorful shredded chicken for tacos, taquitos, tamales, enchiladas and so much more! This recipe is a mild salsa. To add heat, add in 1 red chili de arbol, a pinch of red pepper flakes, or replace the jalapeno with a serrano pepper. Blended salsas can turn pink because of the extra air added when blending. If you don’t like the color and want to develop the redness of the tomatoes, add the salsa to a saucepan and simmer for 20 minutes until the pink turns red. 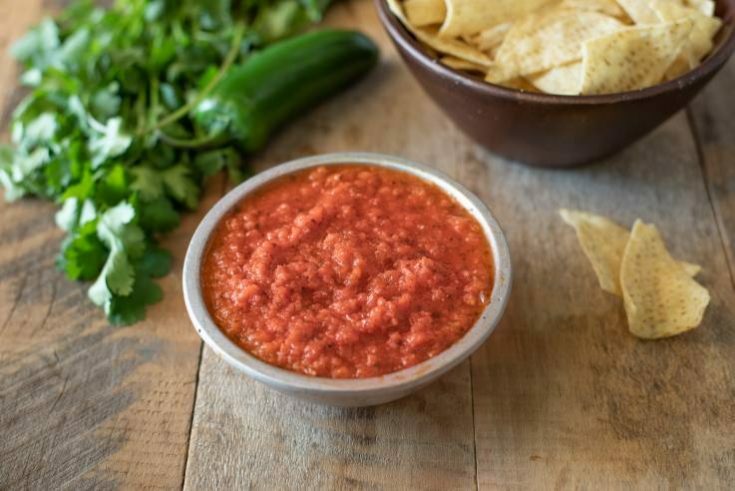 If you’ve tried this Easy Restaurant-Style Red Salsa Recipe or any other recipe on the blog then don’t forget to rate the recipe and let me know how you got on in the comments below. I love to hear from my readers! You can also FOLLOW ME on FACEBOOK, TWITTER, INSTAGRAMand PINTEREST to see daily recipe updates. Tomatoes, onions and jalapeño are broiled until slightly charred then everything is blended with cilantro and salt. Broil until the vegetables until they get slightly charred. Remove and allow to cool. When the jalapeno is cool enough, cut in half and remove the stem and seeds. Add the tomatoes to a food processor and pulse 3 times. Add the onion, jalapeño, cilantro and salt. Blend until it reaches your desired consistency. Taste for salt, add more if needed. Really Great tips here and I loved it. I am surely going to try your recipe. I LOVE that you char the veggies first. I bet this has SO much flavor – can’t wait to try it! I just love homemade salsas! This version looks so easy and I love the fact that you charred the veges first! Perfect! I don’t make salsa often just cos mine never tsatse like the stuff I get at restaurants so thank you so much for this recipe! Love that consistency!